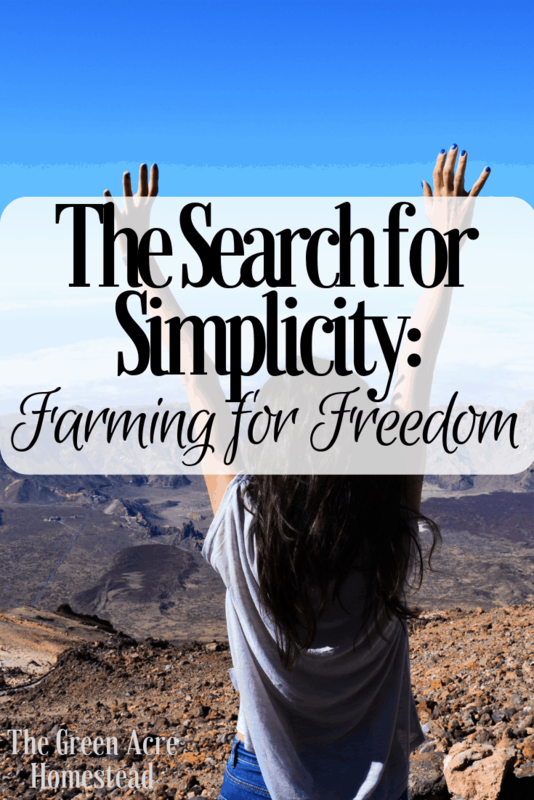 I’m the co-owner of an acre and a quarter of land on the search for simplicity and farming for freedom. Born and raised in Florida, I was fortunate as a young girl to have a mother who was well informed on the value of foods; she knew the importance of supporting our local farmers. Saturday morning Farmers Markets were a regular weekend excursion with four children in tow. I looked upon the fresh honey, unwashed eggs, and mountains of greens and thought farming might be for me one day. I’ll admit I didn’t like getting dirty. In fact, if you told me years ago that I’d eventually look forward to shoveling rabbit and chicken manure for compost, I would have laughed out loud. Fast forward, and here I am 11 rabbits, 9 ducks, 41 chickens, 1 pig, 13 raised gardens, 11 fruit trees, 3 50 feet grape vines later. As I’d imagine it is for many small farmers, Michael Pollan’s mindset above is what drove my husband and me to yearn for this lifestyle and search for simplicity in life. It’s almost the newest fad right now it seems: getting back to the Earth and knowing where your food comes from. In fact, the American Farm Bureau Federation says “The millennial generation (people aged 34 and under) includes 257,454 farmers. More than 20 percent of all farmers are beginning farmers (in business less than 10 years).” If you ask me, I think that’s pretty outstanding. What my husband and I are doing more specifically than just farming for freedom is homesteading. If you haven’t heard of homesteading, then I’m glad you’re reading this. Homesteading is, in short, the act of getting back to a simpler way of life; it’s the ultimate search for simplicity, really. In reality, it’s simply how our grandparents and ancestors lived. I remind myself that “living simply isn’t always simple, but always worth it” and sustain the hope of the fact that this is how it was for our grandparents and parents before them. While on the search for simplicity, we’re also working towards developing a sort of freedom from the hustle and bustle of everyday life by farming. We’re learning how to survive on the seasonal harvest of our land and give back to the Earth that has given so much to us. To tell about my failures, victories, and development of a constant desire to learn is something I long to share with anyone who will listen. Emerson and I have no farming background. Outside of having a small square foot garden in college and being around light gardening while growing up, we were oblivious to how the farming world spun. In the beginning, I didn’t even know I was searching for simplicity. We closed on our homestead January 2016, moved February 2016, 2 and jumped in headfirst. There was no “know-how” on how to raise the ducks and chickens we were gifted and, if I’m being honest, I was scared of the chickens! That was the first victory I rejoiced – getting over my fear of chickens. We quickly learned that colony raising rabbits in Florida was not the best method and that death was not always in our control. With no loss of lessons, we quickly learned the lessons of loss. The first animal we lost was a baby chick Easter 2017. Mama hen hatched this chick all by herself and eventually abandoned it. The chick got fleas and the fleas killed it. Watching my husband hold this sweet, delicate animal in a warm towel as it faded was harder than I could’ve ever expected. It felt that day that my search for simplicity would be the hardest adventure of them all. Yet, I learned that fleas are dangerous and to always have a backup plan for mama hens who hatch baby chicks. Nature soon proved I was not in control. Since then, I’ve lost a 14 chicken meat flock to an unknown predator and 6 kits (baby bunnies) to rodents. Roosters will fight each other to their death to establish an alpha male. Butchering an animal is a sacrifice never to take lightly, and pruning grape vines very well might be the end of me. I’ve persevered and none of these defeats have brought me to quit; I’m almost positive nothing will. I started this blog to spread the word that this lifestyle is one of the best for not only one’s self but the environment alike. Homesteading entails acts such as growing, making, baking and preserving your own food. Homesteading means you rise and set alongside the sun. I’ve become a calmer, more appreciative individual since embarking on this journey to a simple way of living. There’s an unusual sense of appreciation you develop from the opportunity to work with the land every day. My search for simplicity isn’t over yet, but I’m finding more of it every day. Find me every week at the Homestead Blog Hop and read “A Day of Thanks: Today and Tomorrow” next! “If it came from a plant, eat it; if it was made in a plant, don’t.” – that is the quote of my life! It sure is a great one to try and abide by, isn’t it! Hard work, losses and set backs but it is a life I wouldn’t change for anything. Found you on the Simple Homestead Blog Hop. I agree! Thanks for stopping by, Candy!